Include "boy" or "girl" in the Comments box when you check out. Please let us know if there are other siblings in the family - so we can include a surprise for them, too! 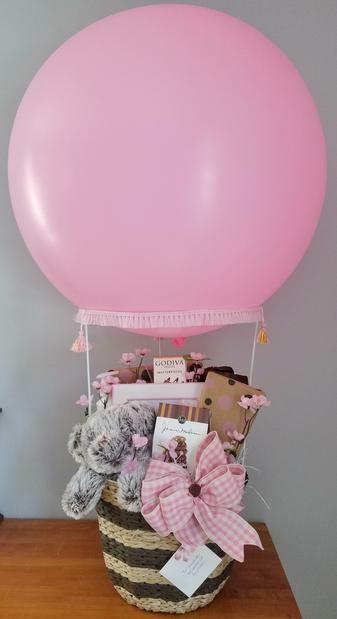 Our most popular gift for families with a new baby, this wonderful basket contains gifts for the newborn, plus a little something for the parents, too! We can also include gift(s) for other siblings of the new baby, too - please let us know when you place your order if there are other siblings in the family. Specify boy, girl, or neutral (yellow or mint). We can also customize the gift for twins or triplets. Other sizes and prices available on special order. This adorable rubber-ducky theme gift basket delights new babies and their families alike! A perfectly gender-neutral gift - and yellow accessories are lots of fun. Includes things like a ducky scrubbie, duckie bib, duckie blanket or towel, and of course, the rubber duckie!! If you want pink or blue accessories included, please specify boy or girl when ordering. Other sizes and prices available - call to order. 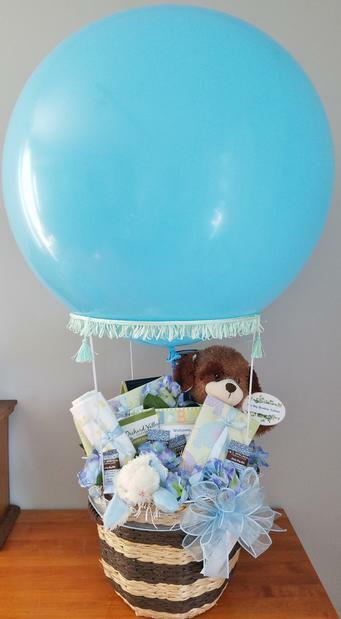 This adorable gift basket is customized with a "Welcome, Little Prince or Princess" panel on the front, and contains a plush animal wearing his (or her!) paper crown, plus a crown-theme picture frame containing the Welcome message. Also contains treats for the new parents! From $34.99. Beautiful gifts for the new addition to the family! 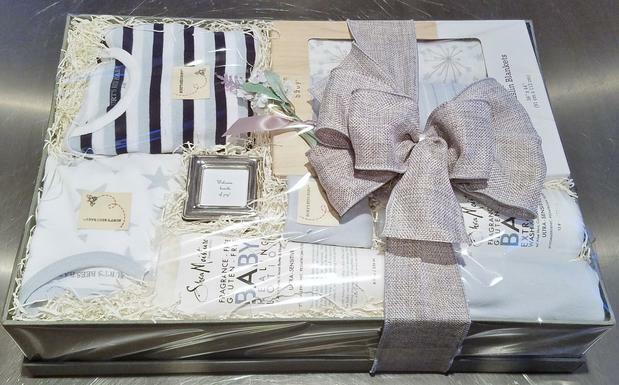 This beautiful, grey linen-patterned photo box is filled with an elegant assortment of gifts to welcome the newborn. Includes clothing/bib for the baby, swaddling blankets, baby care lotion and wash, and small silver-tone picture frame. The lovely lidded box is a great way to gather keepsakes. Customized especially for you, please call early to order.